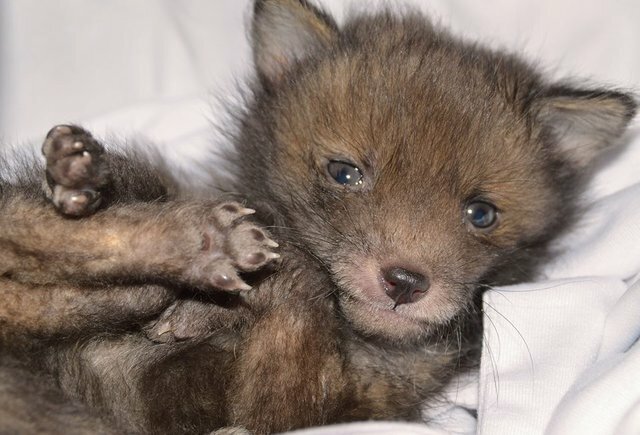 Good Friday may have seemed like a bad Friday for a little fox cub who found himself under a stationary bus in Hertfordshire, England. But luckily, things turned around when someone spotted him and brought him to a veterinarian's office. Carolyn Burns, a volunteer with the U.K.-based National Fox Welfare Society (NFWS), rushed over to bring him home to care for him. The all-volunteer organization has been helping foxes throughout the U.K. for more than 20 years. "At first he was refusing to eat, but after some gentle coaxing he is now eating fine and for his little size is quite feisty apparently," a March 25 Facebook post said. But just days later, Alfie's appetite changed and he was barely eating. Martin Hemmington, founder and coordinator of NFWS, picked up the cub. He literally had to pull Alfie from Burns' hands, according to the Facebook post. "It is easy to see why you would fall for this little lad!" the post said. After Hemmington brought him home, Alfie still would not take to the bottle, until Hemmington liquidized puppy food and mixed it with warm milk. "But within a very short amount of time he stopped eating and just wanted to sleep," the post said. "On each feed he has been the same as this is cause for concern." Alfie should have been double his size at that point. Hemmington feared the cub might have worms, so to ensure that nothing else was going on with little Alfie, he scheduled a vet visit. "He has a certain look to his eyes that I have observed before and I want to rule out Encephalitis and or infection," the Facebook post said. Luckily, Alfie is doing much better now. "The good news is that Alfie, earlier, finally took to the bottle," Hemmington told The Dodo. "And at one point I didn't think he was going to stop drinking, so hopefully now, fingers crossed, he should start putting on weight each day, and he's been given a quick look over at the vets and they are happy." "I was like a dog with two tails when he started sucking on the teat and then I was worried he would have too much in one go," Hemmington said. "So I am giving him the bottle now every two to three hours, and he will be wormed, so this too should help." You can keep tabs on Alfie's progress on the NFWS Facebook page and can make a donation to help foxes in the U.K. here.